Building on our work in careers and labour force intelligence we uncovered what we thought was an under served career pathway into Nursing – The Healthcare Assistant role. The the demise of the NHS Bursary student numbers at university have subsequently dropped by 22% nationally. We will shortly be presenting this data to a local council in order to look at embedding this work within the career pathways and information, advice and guidance given to students and will update this blog post with the outcomes from that meeting. At the Clinical Commissioning Group meeting for the North East we presented the labour force data on the Healthcare sector in the geographic North East of England. In that data we found that there were some roles ( particularly care worker, Nurse roles ) which were under represented due to job posts requesting multiple jobs on one job post. 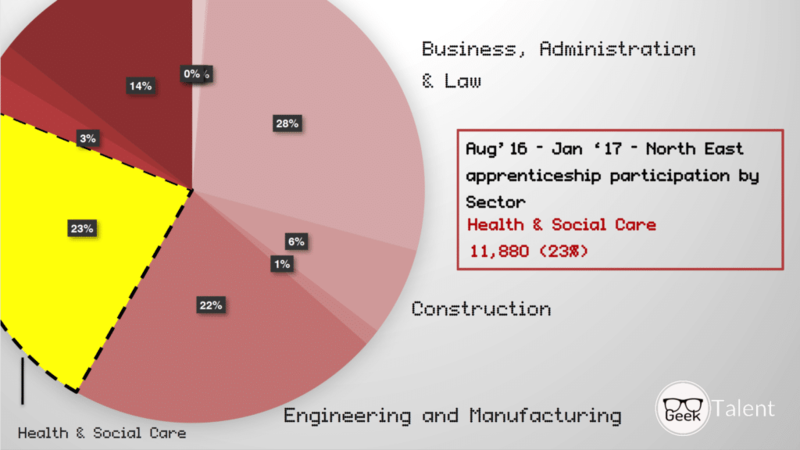 Regardless of the number of actual jobs available the numbers were by far the biggest sector from all sectors locally and nationally. We presented the total number of live vacancies in the North East Healthcare sector as (4,006) along with the number of apprenticeship starts from Aug 2016 to Jan 2017 at 11,880 or 23% of all apprenticeship starts regionally putting it just 5% behind Business Administration. 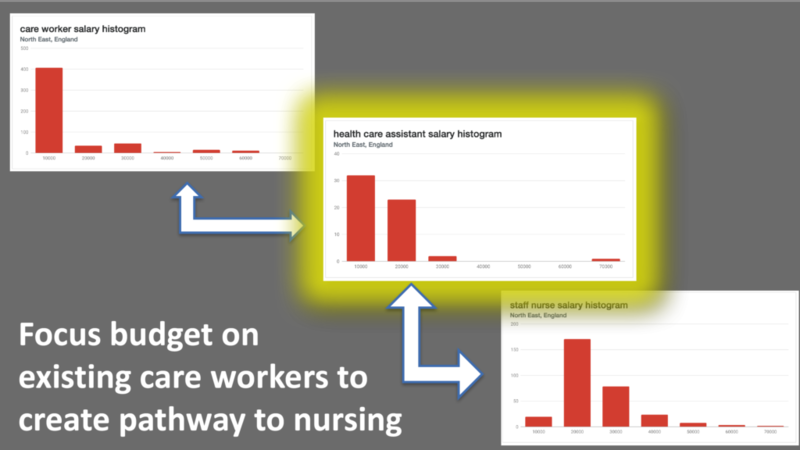 Care workers and Healthcare assistants are both entry level career roles but the Careworker pays minimum wage £14,000 or Apprentice Minimum wage of £3.50/hour depending upon age – yet Healthcare assistant pays slightly more locally at around £17,500 yet the Healthcare assistant role has statistically higher progression into Nursing. See the following salary data as an example. Create a pathway to nursing through vocational and apprenticeship training for Healthcare assistants to progress into Nursing. This will not only help with retention in the sector but also support the drop in those taking the Academic pathway. We also realise this is sometimes easy to say but hard to implement due to other market forces at play. For example the Care worker role is generally run by private healthcare companies funded through local authority budgets which has a high churn rate with some reports commenting that over 73% leave within 2 years of starting – http://www.uniqueiq.co.uk/spotlight-home-care-employee-turnover-high/ sighting zero hour contracts and low pay as the culprit. This leads a short-term, fire fighting delivery model for the care worker role without HR talking to staff about eventually leaving the private sector to then work in the NHS eventually as a nurse where training and benefits are better. Our call to local authorities is to make use of your ESFA funding to provide fund education and training routes to Nursing for those caring individuals who have chosen to take the care worker role. Work with your providers to ensure career pathways are presented to all to improve attrition rates for those who choose to work first rather than progress to University and have shown a passion for a caring profession. Nursing Apprenticeships will be a potential route-way in 2018 for some and should also be invested in but the local authority, private providers, CCGs, GP Practices and Hospital Trusts will all have to work together for the good of an ever increasing sector.